May | 2015 | Scuffalong: Genealogy. 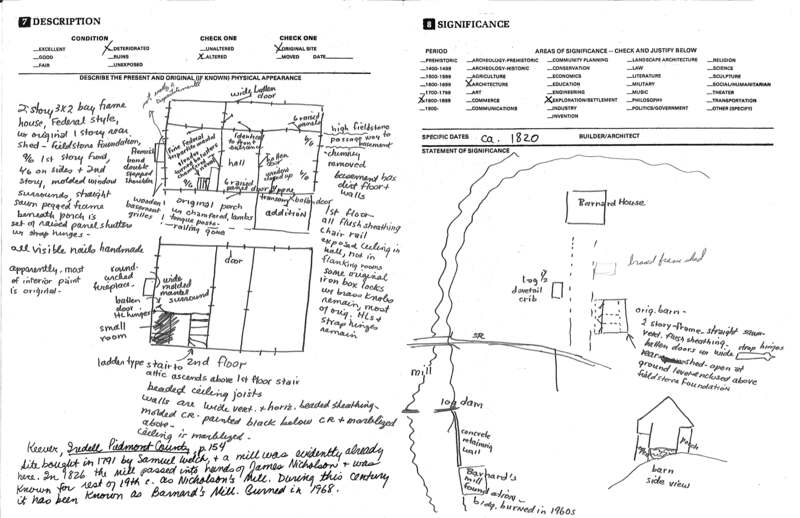 May 2015 – Scuffalong: Genealogy. Henrietta Rebecca Colvert! I’ve never seen a middle name for Henrietta before, and it’s nice to see that she was named for her father’s step-mother. 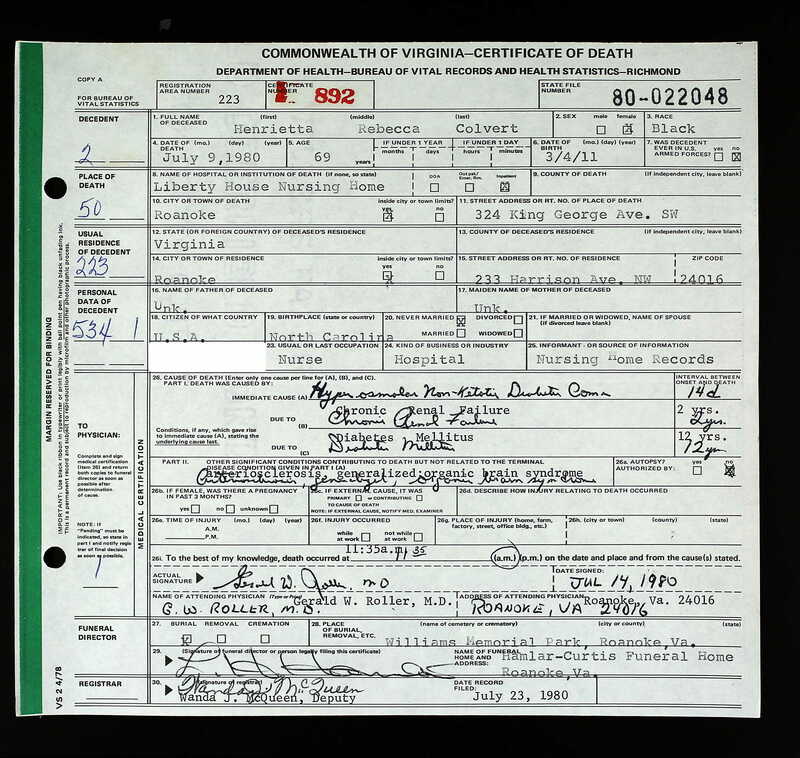 Date of birth — 4 March 1911? More like 1893. I’m still not sure how Henrietta wound up in Roanoke, though I assume she ended her nursing career there. The Colvert “home house” in Statesville was on Harrison Street. The nursing home in which Henrietta spent her final years was on Harrison Avenue. E.S., my grandmother’s first cousin and son of Henrietta’s sister Ida Colvert Stockton, lives in suburban D.C., and he told me that he and his wife visited Henrietta in her declining years. Did my grandmother know that her aunt was living in Roanoke? Did she know when she died? Is her grave marked? There’s no listing for it in Williams Memorial Park at findagrave.com. New Ancestor Discovery, no. 1: Stephen Nathaniel Grant. I don’t know. Am I? 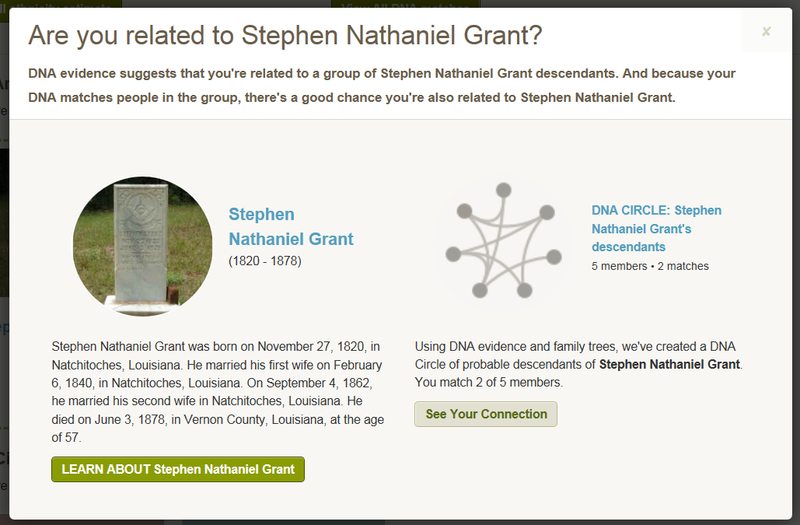 Ancestry’s bio of this NAD (it’s based on a compilation of 143 user family trees, and so may be way inaccurate): Stephen Nathaniel Grant was born on November 27, 1820, in Natchitoches, Louisiana, to Stephen Grant and Marie Louise Saidec. He married Marie Celine Armand on February 6, 1840, in Natchitoches, Louisiana. On September 4, 1862, he married Marie Adelaide Elizabeth Armand in Natchitoches, Louisiana. He lived in Natchitoches, Louisiana, from 1850 to 1865 and moved to Calcasieu, Louisiana, sometime between 1865 and 1870. Stephen died on June 3, 1878, in Vernon County, Louisiana, at the age of 57, and was buried in Leesville, Louisiana. At first glance, I’m puzzled. Natchitoches? All my roots lie north of South Carolina and east of the Appalachians. “Grant,” though. That stirs an antenna. My great-grandmother Bessie Henderson‘s putative father was Joseph Buckner Martin (1868-1928). Buck’s parents were Lewis H. Martin (1836-1912) and Mary “Polly” Ann Price (1836-1902). Lewis H. Martin was the son of Waitman G. Martin (1810-1866) and Eliza Lewis (1813-??). Waitman G. Martin was the son of Lewis Martin (1779-1820?) and Charity Grant (1788-1864?). Charity Grant was my great-great-great-great-great-grandmother. Is Ancestry picking up a connection this distant? It has matched me to collateral Price and Lewis descendants. Maybe Grant then. I know very little about Charity Grant. Unsourced internet information asserts that she was born 7 October 1788 in Wayne County to Ephraim Grant (1765-1864) and Nancy Kinchen. The date of her marriage to Lewis Martin is unknown; their other children were Lavinia G. Martin (1812-1899), Abraham George Martin (1815-1862) and Henderson Napoleon Martin (1821-1877). 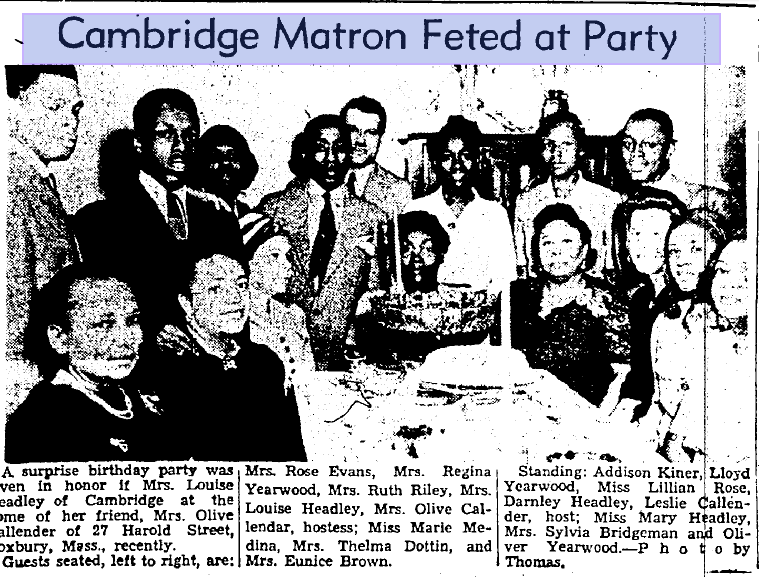 (Henderson Martin married Bethany Lewis, daughter of Urban and Susan Casey Lewis, and sister of Waitman’s wife Eliza Lewis.) Charity allegedly died in 1864 in Onslow County. There’s a lot about this I don’t trust though. 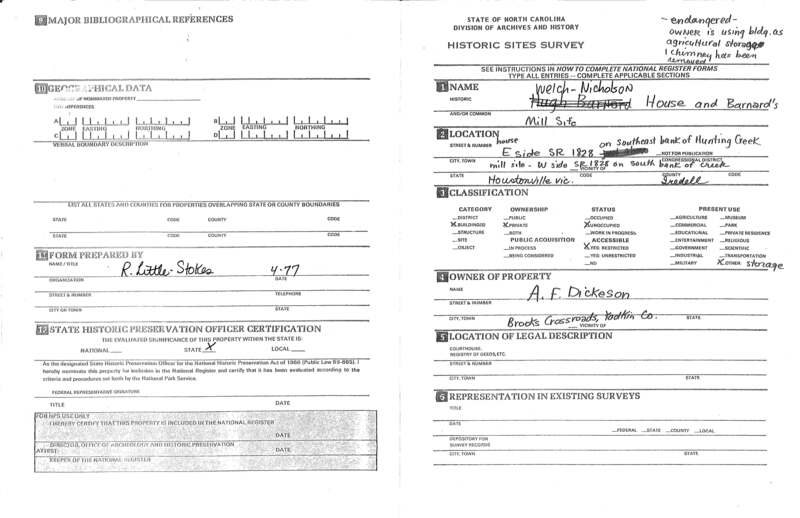 I consulted Marty Grant’s website, http://www.martygrant.com, which contains the most detailed accounting of the evidence regarding early Wayne County Grants available. He lists a daughter Charity for Ephraim and Nancy, but notes that she was born in 1824 and married Martin Johnston. The only other early reference that I have for Charity is Michael Grant’s 1818 Wayne County estate record, which mentions Charity Martin as the purchaser of “7 bus. & 3 Pecks corn” at his estate sale. (It also lists Elisha, John and Stephen Grant among Michael’s creditors.) Michael Grant was a close neighbor of William and Elisha Grant in the 1790 Wayne County census. Marty Grant conjectures the three as brothers and Charity as William’s daughter. I dug a little deeper on Stephen Nathaniel Grant. (Meaning, I tried to make sense of the mish-mash of information in the trees of his descendants on Ancestry.) 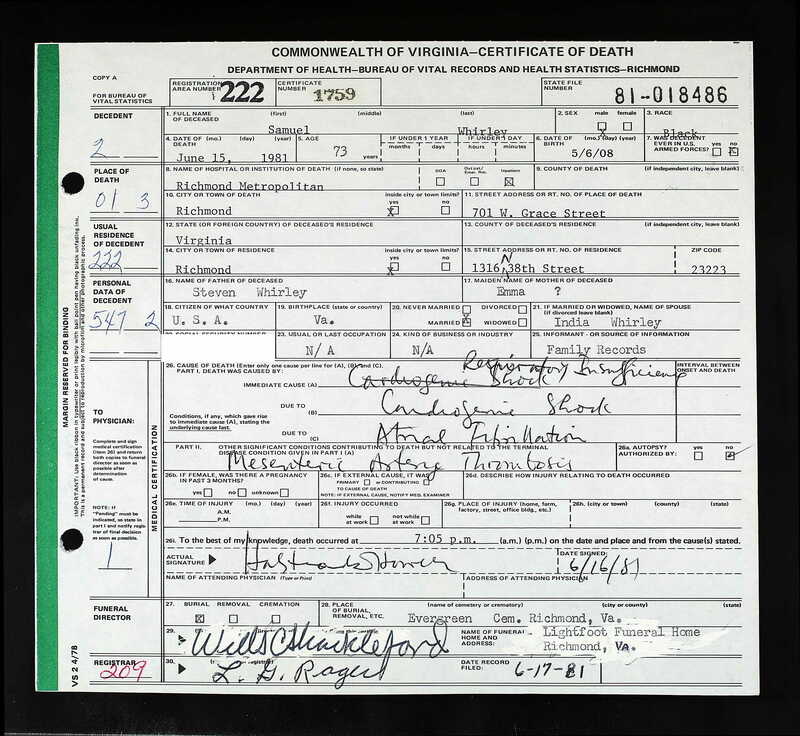 With no attribution, all seem to agree that Stephen’s father was also named Stephen Grant, born 1770 in Tolland, Connecticut, died 1821 in Ouachita Parish, Louisiana. Stephen Sr.’s father is also uniformly listed as Ephraim Grant, born 1726 in Tolland, Connecticut. These Stephens and Ephraims stretching from New England through North Carolina to Louisiana are intriguing, but what’s my link? M.G. — a “very high confidence” DNA match — 20-30 centiMorgans, meh — estimated in the 4th to 6th cousin range; descends from Stephen via daughter Louisa O. Grant Simmons. D.E. — not a DNA match; also descends from Stephen via daughter Louisa. kehokk — not a DNA match; also descends via daughter Louisa. J.F. — an “extremely high confidence” DNA match — more than 30 cM — estimated in the 4th to 6th cousin range; descends from Stephen via daughter Elizabeth Grant Bolton. J.F.’s cousin administers this account and knows little about this line. AnthonyQuinn1987 — not a DNA match; also descends via daughter Elizabeth Grant Bolton; J.F. and AnthonyQuinn1987 also share (1) Wiley Hunt (1798, Georgia-1880, Louisiana) and Susan Alford Hunt (1812, North Carolina-1880, Louisiana); (2) John Alexander Brown (1819, South Carolina-1881, Louisiana) and Anny Harris Brown (1828, Georgia-1911, Louisiana); and (3) John F. Bolton (1815, Tennessee-1883, Louisiana) and Mary Ann Goodman Bolton (1818, Alabama-1897, Louisiana) as common ancestors. For now, I have no idea how I relate to M.G. or J.F. (especially at the predicted closeness), or if Stephen Grant was closely related to Charity Grant, or if Grant is a red herring and some other common ancestor ties me to these two. Evidence of the rites of matrimony. No mystery why I didn’t find this earlier. Jonah Wiggins? No, actually, Jonah Williams, brother of my great-great-great-grandfather Adam Artis. 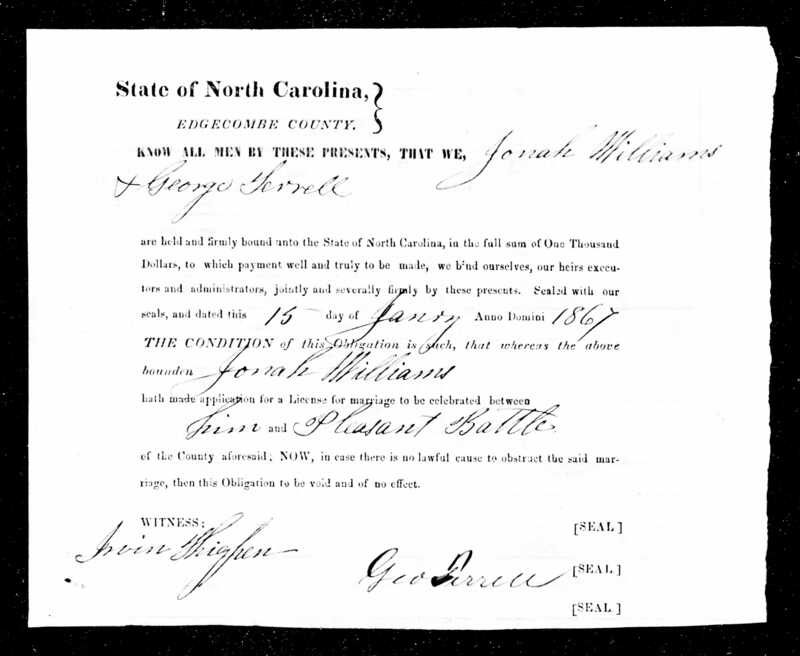 And though I knew Pleasant Battle was from the Battleboro area, I don’t think I’d ever searched Edgecombe records for their marriage license. I don’t know who George Terrell was to Jonah. 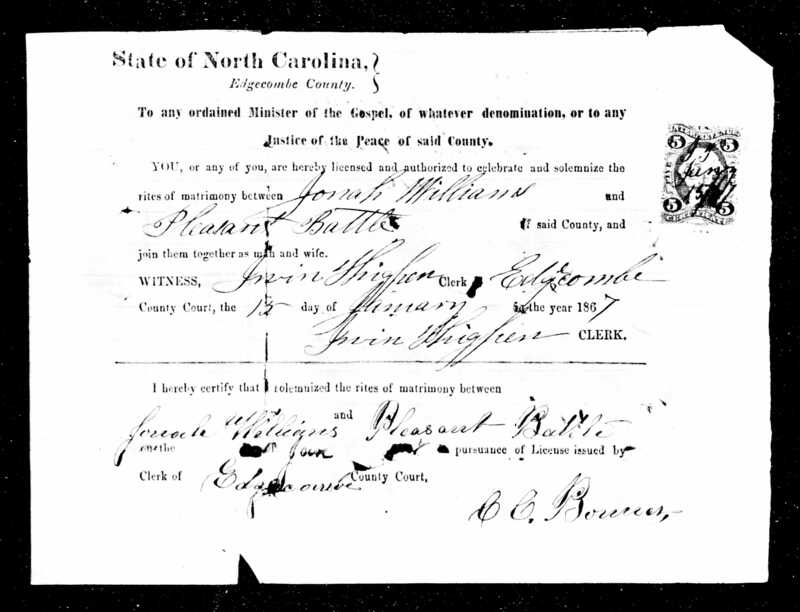 He and his wife Martha Lindsey, who married a few days before Jonah and Pleasant, appear in the 1870 census of Cokey township, Edgecombe County. I’ve written about Angeline McConnaughey Reeves and her family — particularly her daughter Carrie Reeves Williams. But what of her other children? Frank Eccles and Ada Reeves, colored, were married Tuesday night. The groom is Farrior’s man “Friday.” He is a good citizen and deserves happiness and prosperity. 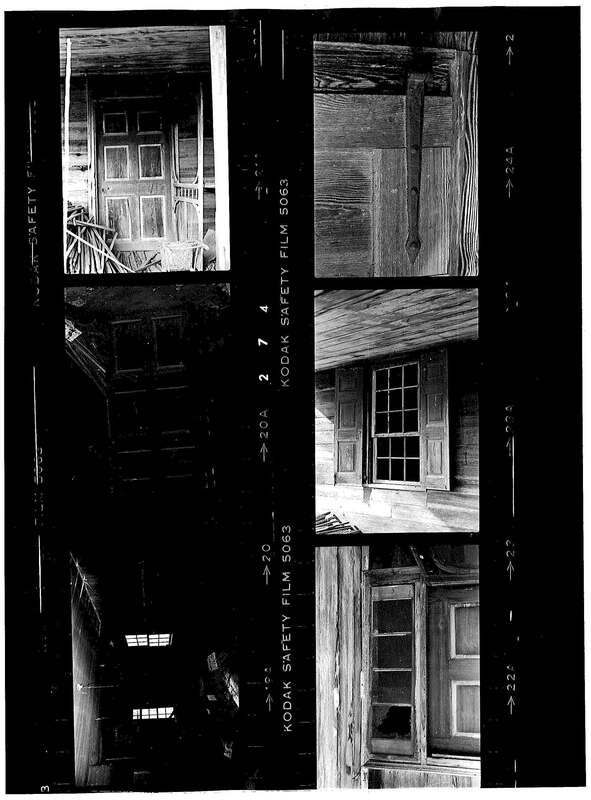 Five years later, the census taker trudging through Charlotte’s Fourth Ward knocked at the door of 413 Eighth Street. Forty-two year-old Angeline Reeves likely answered the door. 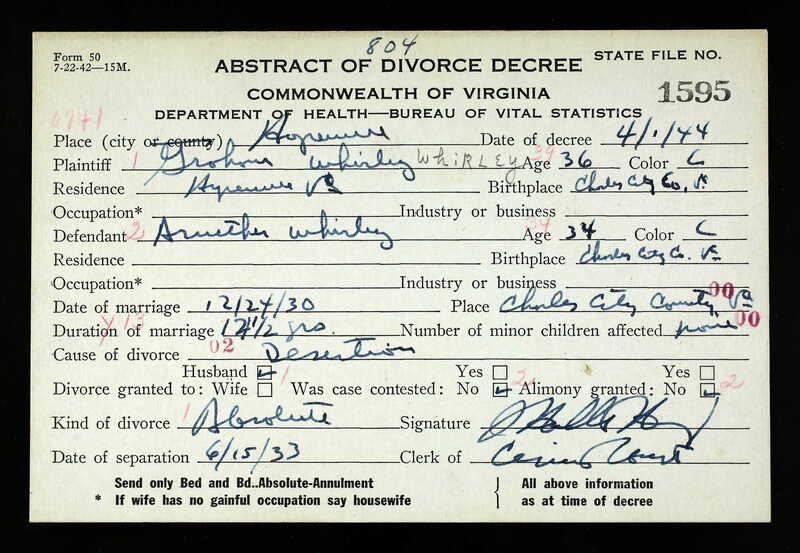 In response to the enumerator’s queries, she identified her husband Fletcher as the head of household and detailed the three children remaining at home — 18 year-old Frank, 16 year-old Edna, and 12 year-old John. 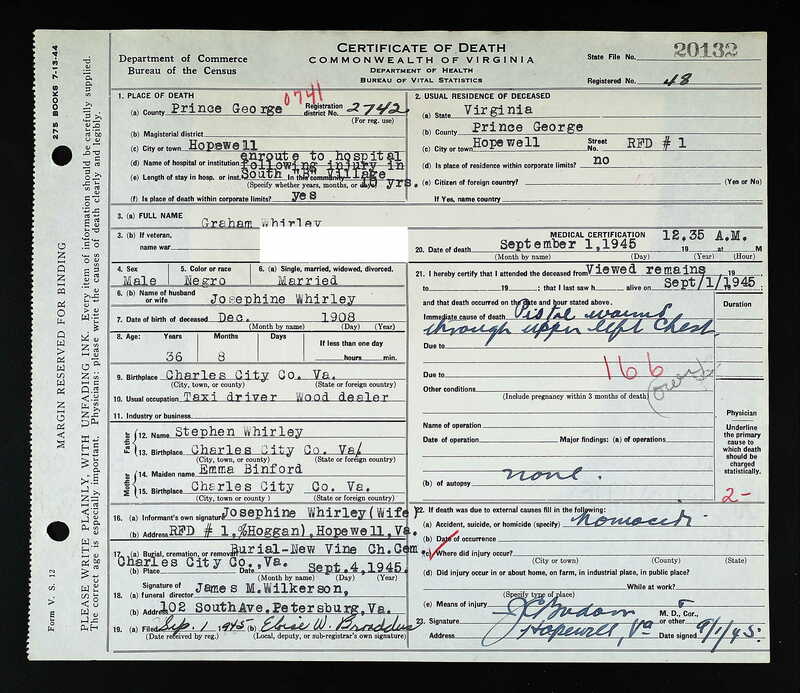 Daughter Ada, her husband Frank and 4 year-old son Harry were probably living in Charlotte, but seem to have given the enumerator the slip. Frank married Kate Smith in Charlotte in 1902; their ill-fated story is told here. Edna was next to wed. 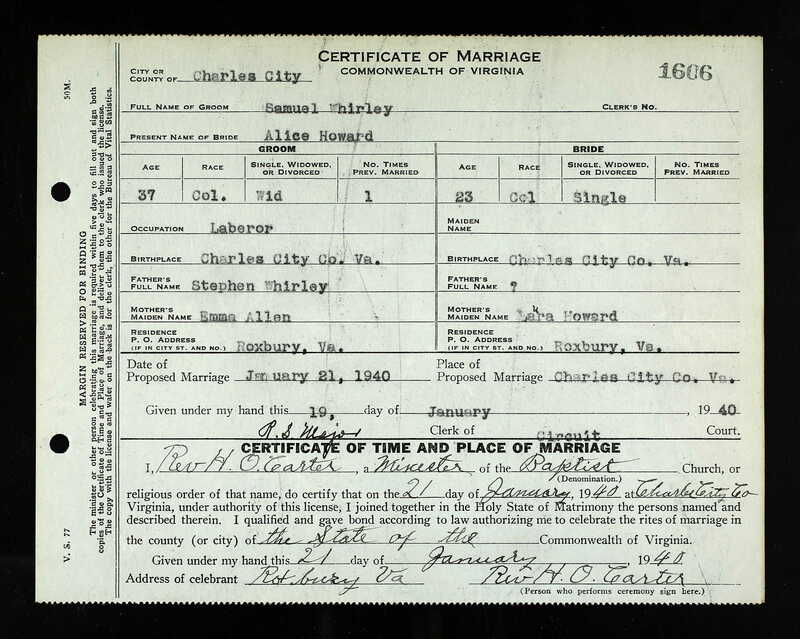 In 1905, at the Mecklenburg County Courthouse in Charlotte, William H. Kiner applied for a marriage license for himself, age 25, of Boston, Massachusetts, colored, son of Anderson and Agnes Kiner, and Edna Reeves, age 20, of Charlotte, colored, daughter of Fletcher Reeves and Angeline Reeves. Robert B. Bruce, minister of the AME Zion Church, united them in matrimony on 5 April 1905 at the bride’s residence. According to Kiner family researcher Peggy Jorde, William Henry Kiner, actually a native of Staunton, Augusta County, Virginia, had come to Charlotte to study theology at Biddle University. 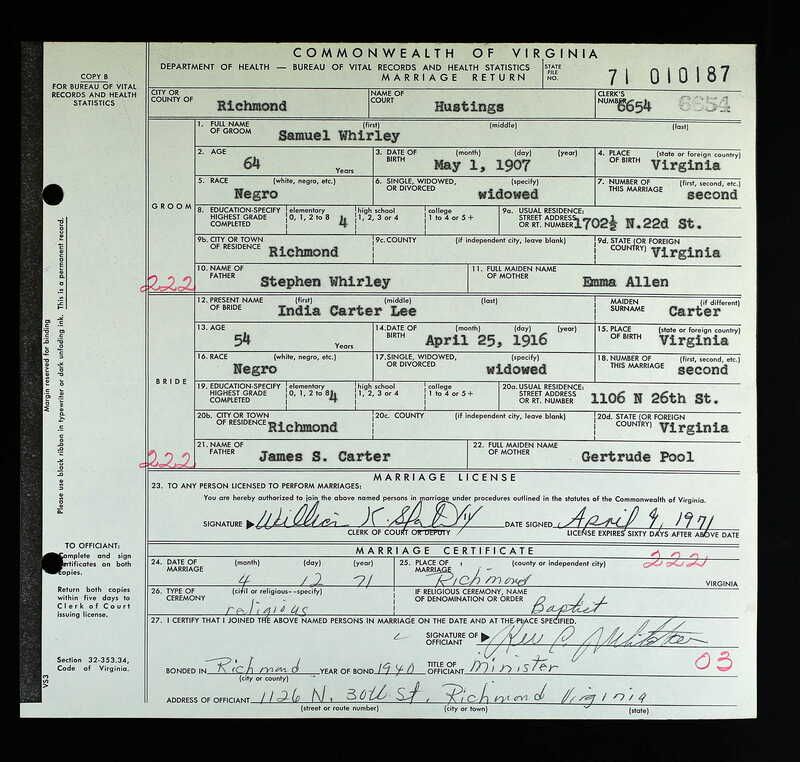 William and Edna’s first son, Addison F., was born in Charlotte in 1906, but by the following summer, when son Carroll Milton arrived, the Kiners were permanent residents of Massachusetts. Carroll has two birth records, one listing his birth place as Oak Bluffs, and a second listing Cambridge. On the first, William’s occupation was described as theological student. Edna Reeves Kiner was not the only one of Fletcher and Angeline’s children to pack up and move north to the Bay State. The 1910 census of Cambridge, Middlesex County, shows William H. Kiner, wife Edna E., children Addison F., 4, and Carroll M., 2, sister-in-law Ada Ecles, and brother-in-law John H. Reeves living at 8 Rockwell Street. William worked as a clothes presser in a tailor shop, Ada as a servant, and John as a hotel waiter. Ada’s husband Frank (and son Harry) are nowhere to be seen, but “Aida” Eccles appears a second time in Cambridge as a servant in the household of George W. Clapp, a self-employed chemist. 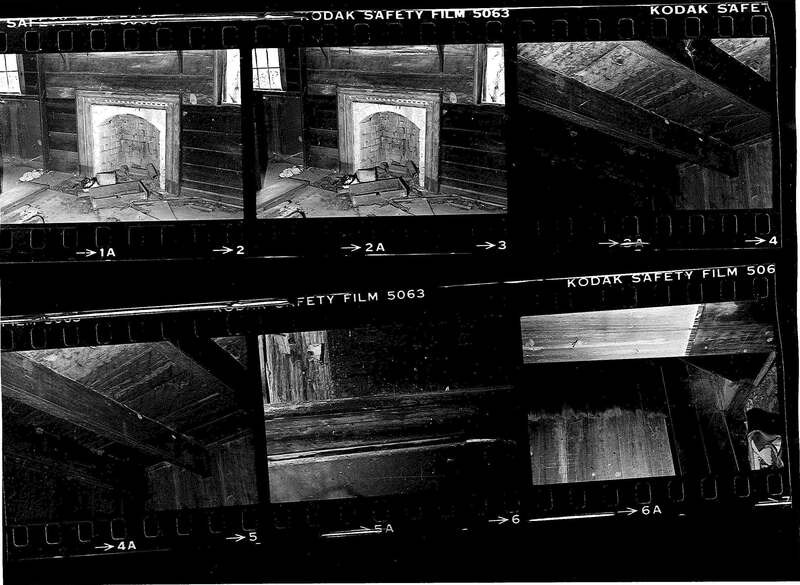 John Reeves’ stay in New England did not last long. 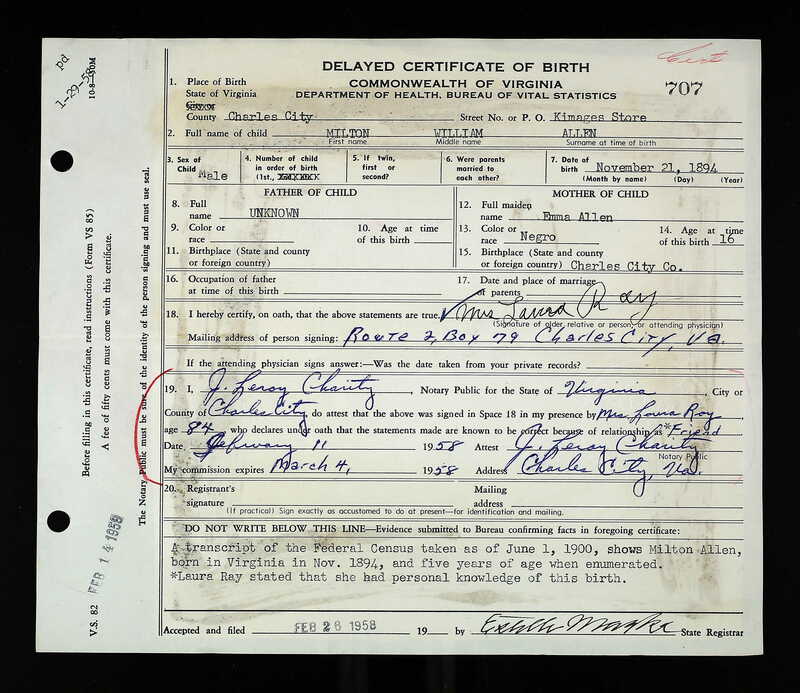 In April of 1915, at the age of 26, he died of tuberculosis in a state hospital. Meanwhile, it’s not clear that William Kiner was ever able to respond to his religious calling. 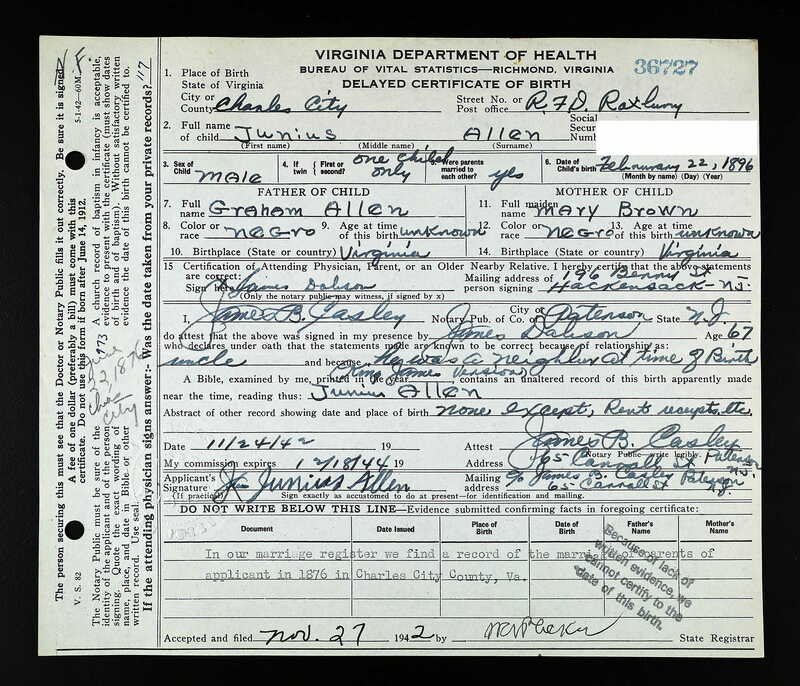 When he registered for the World War I draft in 1918, he was working as a chipper in a foundry at Hunt-Spiller Corporation. Two years later, when the 1920 census of Cambridge was recorded, William was described as a chipper in a shipyard. His family, still at 8 Rockwell Street, included wife Edna E. and children Addison F., Carroll M., and Evelyn C. Kiner. Ada Eccles and her 23 year-old son Harry Eccles, a laundry janitor, had found their own lodging and appear in the 7th Ward at 65 Grigg Street. 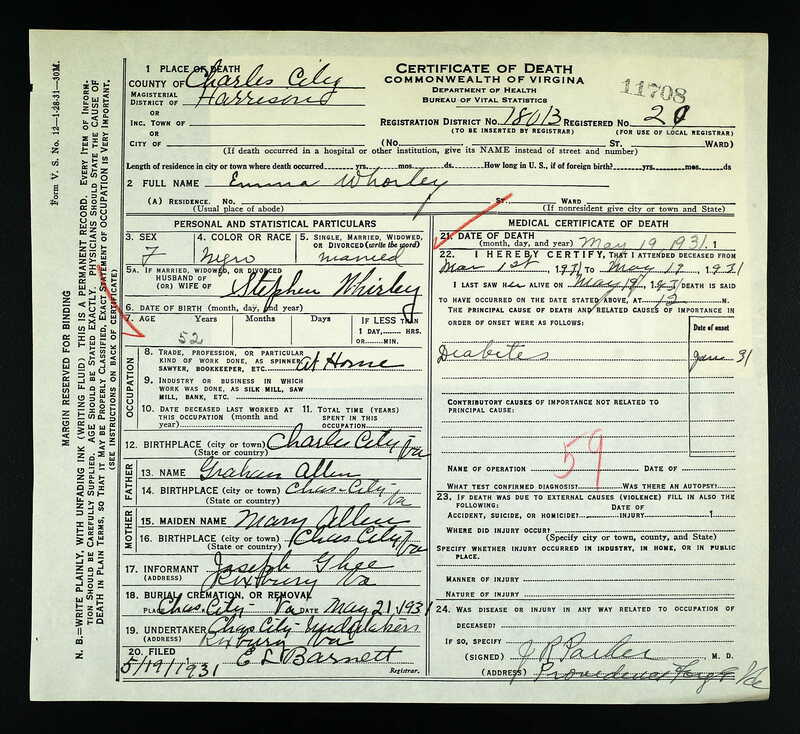 I have found no death certificate for William H. Kiner, but assume that he died between 1923, when he last appears in a Cambridge city directory, and 1930. 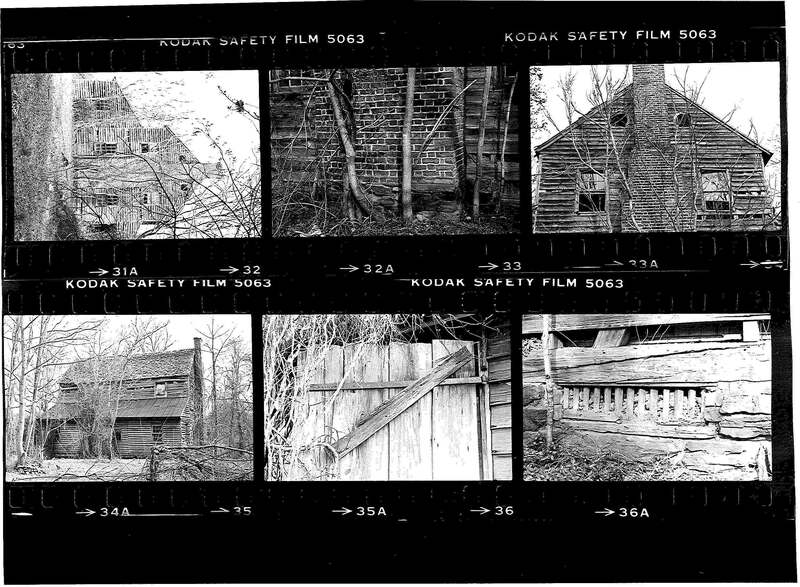 In the latter year, the census taker listed his widow widow Edna M. Kiner, her children Addison F., Carrell M., and Evelyn C., plus aunt (sister, actually) Ada M. Eccles living on Essex Street in Cambridge in the household of Joseph S. Blackburn, a black Kentucky-born railroad porter, and his wife Cynthia, a beauty shop manicurist born in Maine. Addison worked as a department store elevator operator and Carrell as a shoestore porter. The Kiners emerged from the Great Depression decentralized. In 1940 census, Edna Kiner was over the river in Boston, Suffolk County, living in an apartment or shared house at 361 Massachusetts Avenue. Her son Carroll Kiner, a 32 year-old shoe store porter, lived in Cambridge with his Virginia-born wife Ella and three year-old daughter Caroline at 27 Pleasant Street. 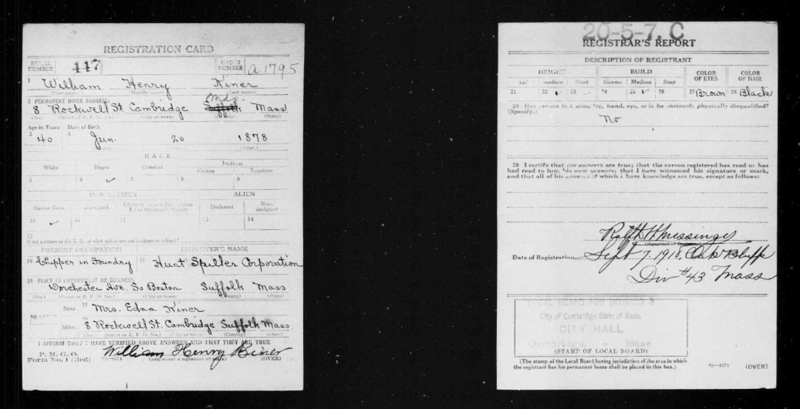 Addison Kiner was not captured in the census, but he seems to have remained in Massachusetts and was active in Cambridge’s small African-American social scene. The Afro-American, 20 June 1942. 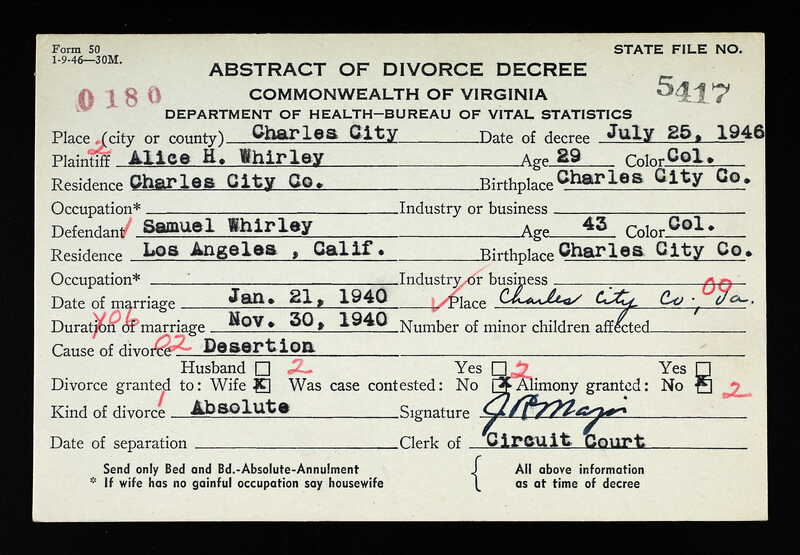 Daughter Evelyn C. Kiner had completely escaped the Bay State orbit, however, having moved to New York City and begun work as a social worker with the Department of Welfare. She was living in the heart of Harlem at 172 West 127th Street, between Lenox Avenue and what was then Seventh Avenue. She quickly integrated into the Harlem world and over the next ten or years or so appears half-a-dozen times in the social columns of the New York Age. Evelyn’s primary social activities swirled around her membership in the National Urban League Guild, but she was also actively involved in civic outreach through the Church of the Master, a Presbyterian congregation at West 122nd and Morningside. City directories show that Edna’s sons remained in the Boston area the remainder of their lives. She, however, moved to New York to live with Evelyn in her declining years and died there in August 1969. I don’t know exactly when Carroll died, but I’m a little haunted by how closely my path crossed with Addison and Evelyn. In the fall of 1986, I arrived in Cambridge, Massachusetts, for my first semester of law school. My residence hall, a graceless, L-shaped brick hulk, was at the campus’ far northwest corner, at Massachusetts Avenue and Everett Street. (I lived on the fourth floor of Wyeth Hall that year. Michelle Robinson Obama lived in the suite one floor above.) Unbeknownst to me, if I had walked a mile straight up Mass Ave, turned left on Walden Street, and knocked at No. 28, Addison Kiner would have answered the door. As far I can tell, he lived there for the three years that I was in Cambridge. He died 7 May 1990. After law school, I enrolled in graduate school at Columbia University. For the two years I was there, I lived in an apartment building on 121st Street, at the crest of the hill between Broadway and Amsterdam. Walking west down 121st led me to the edge of Morningside Park. 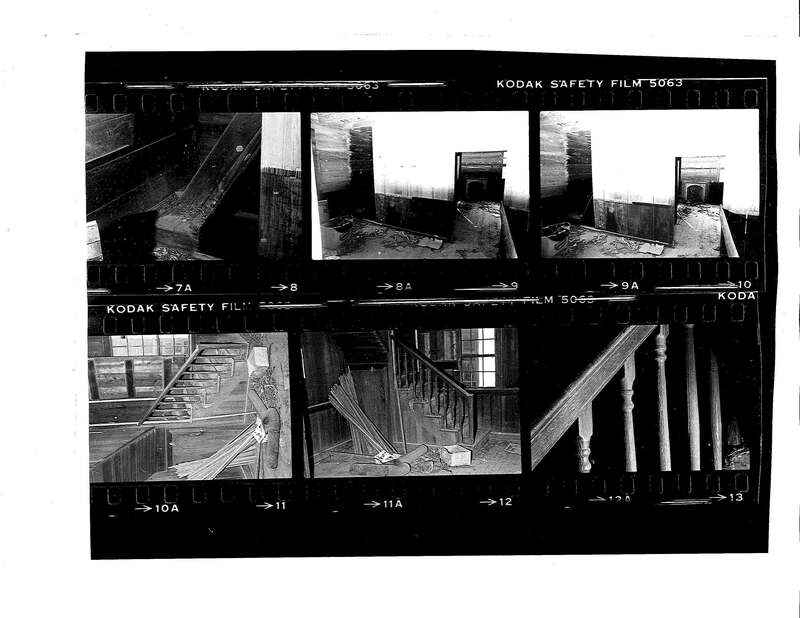 Had I descended through it — and I didn’t in that era, which was crazy, crack-ravaged Manhattan at its nadir — I’d have landed on the plain of central Harlem just a block or two from Evelyn Kiner’s beloved Church of the Master. She died in February 2003, and the church was demolished six years later. The ninth in an occasional series excerpting testimony from the transcript of the trial in J.F. Coley v. Tom Artis, Wayne County Superior Court, November 1908. I have been claiming this land all the time. I have not been listing it for taxes. Before the mortgage was given I was listing it. I have not listed it ever since 1892, ’till this last year. I listed my other property, but don’t know that listed this land. I have been mortgaging the crops on this land. I mortgaged it one year in 1893. I guess I did. To Mr. Minshew. I don’t know that I described the land in the Minshew mortgage as the land belonging to Napoleon Hagans. I don’t say I didn’t. I can’t tell the date, but I have rented some land from Hagans. Two or three years. That mortgage to Minshew was intended to cover the crops to be made on the 30 acre piece. (Defendant objects to all about mortgage.) I don’t know that I made another crop lien on that same land in 1895. I don’t remember that I made one then. I made a mortgage to Mr. Peacock in Fremont on the same land. I described the land as mine. I don’t know that I said it was known as the Hagans land. I made a crop lien to Peele & Copeland in 1906. That was to cover crops on the 30 acre piece I guess. I described it as the land known as Will Hagans land. I guess, I don’t know. I might have described it as mine. I made Peele & Copeland another crop lien in 1907 on the same land. I described it as the land known as the Will Hagans land, if its there, I expect I did. I didn’t say in that mortgage that it was my land. On April 16th 1908 I made Peele & Copeland another crop lien. I don’t know that I gave them a mortgage this year. I may have. I guess I did. If it shows it, I did. I described it as my own land. First time that I ever put a statement in a paper or that made reference to crop on this 30 acre piece, that they would be grown on my own land. On March 23rd 1908, I made a real estate mortgage on this land to Peele & Copeland for $420.00. This crop lien I made this year, and also this mortgage on this land was made after the action was made to recover the land. I rented some other land from Hagans beside the 30 acre piece. I didn’t have any of the Hagans land under rent beside the 30 acre tract last year in 1907. I had land rented off, but not the Hagans land. (This action was brought March 18th 1908.) The real estate mortgage to Peele & Copeland was given Mar. 23rd, 1908. Was served Mar. 27th 1908, and the crop lien Apr. 16th 1908.) Last year I didn’t have any of W.S. Hagans’ land rented. I cultivated only the 30 acre tract, and lived in the house on the other side. (Summons introduced by Plaintiff.) At the time Mr. Cook was negotiating about buying this land from Hagans I was cultivating the 30 acre tract, and was living across the line on the 24 acre piece. I knew that Cook was trying to buy the Calv place. I didn’t know that he was trying to buy both places then. Not until I heard from other people that he was trying to buy both places. I heard that a few days before he came up here to get the papers fixed. When I heard this news, I didn’t go see Mr. Coley. I happened to see him. I was just passing and saw him. He spoke to me first about it. He said he understood Mr. Cook was about to buy all the land about there, and mine too. He said why didn’t I let him know. He said if he had known it he would have bought some. I told him I understood they were going to fix the papers the next day. I said if he is, I am going to Goldsboro, and he said if you go, and he and Cook don’t trade, tell Hagans to send me a note. I went the next day, and I told him exactly what he told me. I carried it to him. The rumor was that he Cook was buying both places. I told Coley that if anybody got it I would rather him get it, for I didn’t think that I could get along with Mr. Cook. I didn’t have any reference to my place. I didn’t tell Coley that I didn’t mean the 30 acre piece. I told him myself. I told him I understood Mr. Cook was trying to but all the land down there, trying to buy the 30 acre piece and the 24 acre piece. I told him I was coming to Goldsboro, he asked me to speak to Hagans. I told him if anybody had to have it, I had rather for him to have it than Cook. I came and saw Hagans. I didn’t ask Hagans not to sell it to Cook. I didn’t ask him to let Coley have it. I didn’t tell him I would get along better with Coley than Cook. I didn’t say that. I don’t remember that I told Hagans I could get along better with Coley than Cook. I don’t swear, but I never told him that. I told Coley. I told Hagans what Coley said, if he and Mr. Cook didn’t trade to send him a note. Hagans and Coley did trade. They went to my place. I got in the buggy with him. Rode over to Mr. Coleys. They were talking but I don’t know what they were talking about. They were around the house. I didn’t hear a word except that Hagans would see him later, maybe some other things were said, I don’t remember. I didn’t hear how much Coley was to give him for it, not until he had bought it. Mr. Coley came, but I don’t know if he came to see me. He just passed by. He didn’t say anything about renting it. He said he never knew where these lines were, and he said he wanted me to go around and show them to him. I don’t know whether he had any deed for it or not. I went all around and showed him the lines between his and mine too. There was a fence off the line a little. He told me to take the fence and put it around the pasture. He didn’t say he wanted me to. I didn’t move the rails of the fence, because Mr. Cook saw me with my cart. He said that fence was on the line of the 30 acre place, and told me not to move it. I didn’t because Cook said it was on the line. I went to move it. 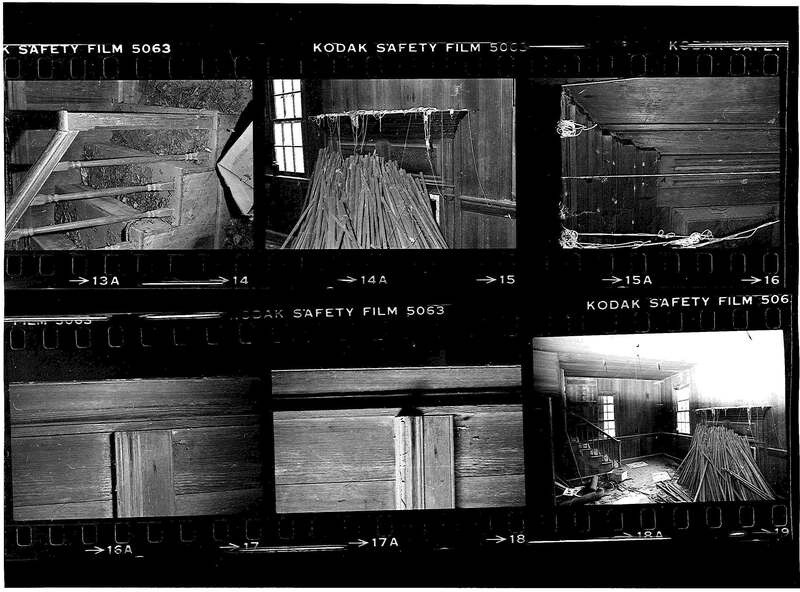 This fence was on the line between the 30 acre place and Cook’s line, not between the 30 and 24 acre pieces. Mr. Coley came back at another time, and talked about renting the land. Never reached any agreement. He said Uncle Tom aren’t you going to rent it. I said “No, I never rented my land.” I told him all the time it was my land, when I was showing him the corners etc. He was Now was the time to stir while it was hot. I told him I didn’t have to rent my own land. I told anybody that it was my land. I don’t know when I told Coley first it was my land. He knew I suppose that it was my land. I told him before I went to see Hagans that it was mine. I offered to buy from Hagans an acre along the 24 acre piece. He asked me if I couldn’t get somebody else to buy the rest of it. I told him I didn’t know. I never offered to buy the 30 acre piece, in presence of Reid or anybody else, nor offered to pay any on the mortgage, but I told him I could take up the mortgage. I told him that this year, and told him so last year. This last winter. I made a mortgage to H.J. Harrell in 1895. It was intended to cover crop on the 30 acre tract. I described it as the Hagans & Ward land. I tended some land on the Ward place, the other was on the 30 acre piece. That was on the 11th of May, 1908. (Book 18, Page 180) Reason I didn’t move the fence was because Cook stopped me. I didn’t go to see Coley and tell him what Cook said. I told him about about it. I don’t remember where I told him, but I told him. I said Mr. Coley Mr. Cook said you gave him these rails, and he said no he didn’t. Cook had done moved the rails. I was aiming to have the line run. I went to have the lines turned out. I knew the fence was off the line for maybe 25 years. I never have had it run. I didn’t advise Mr. Coley to have it run. I showed Mr. Coley lines and corners, because he asked me to go around with him. I told him at the time it was my land. I didn’t tell Coley he would get Cook’s tobacco barn. I told him the line would strike the tobacco barn. It was on my side. There had been a division since then. He had alreday told me that Hagans had sold him the land, he wanted to know the land between me and him. He said, “Let’s go all around and we went with two more men. I told him it was my land. He asked me why didn’t I stir it while it was hot. He said not to let it get cold, do it now. I gave Peele & Copeland a lien on this land for $420. for supplies etc. I owed for supplies last year and for now. I have a statement of how much I owed him. He had crop lien as security last year. I paid him some. I owed him about $300 together with the mule claim and cow, they amounted to about $200 or $300. I gave him a note for $420. I bought the mule from Mr. Pat Coley. He stood for me. That was put in the Peele & Copeland mortgage. They took up my claim for Mr. Pat Coley. I gave them a mortgage for $420.